Berry Sorbet from Wood Wick was in my cart the second I saw it. I’ve always been a fan of sweet berry scents so the added “sorbet” component told me everything I needed to know. 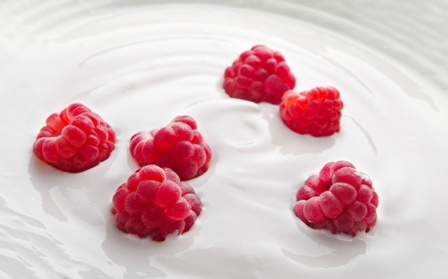 Mmm, berries drenched in whipped cream… that sounds perfect!! Bonus, I love the crackling sound of the wooden wick burning so in my powder room it went for not only maximum scent throw but also pure sound enjoyment. Smelling the wax… my nose inhaled berries and whipped cream all the way. The moment I lit the wood wick, the blow torch/crackling sound instantly filled the room and it put a huge smile on my face. The sound reminds me of a cross between a blow torch sound and crackling wood from a fire. It is so very cool to hear. 😊 Once the wick was lit, it took a good hour to reach a full melt pool and the aroma… sugary berries and vanilla cream all the way – the berries definitely the strongest component. My powder room smelled like sweet berries, sugar and whipped cream. I liked it, it just wasn’t as strong as I hoped it would be. Which brings me to strength – I would rate Berry Sorbet a 5 out of 10 in a really small room. Anything larger and the aroma would be completely lost. How did my Berry Sorbet candle burn? This candle burned perfect. I did have to trim the wood wick periodically or the flame would get a little too large but that’s pretty common with wood wicks. Trimming is a must. 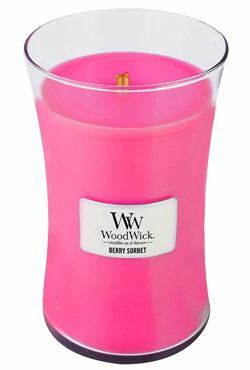 Berry Sorbet was a sweet and creamy berry scent I did enjoy from start to finish. Had it been a tad stronger, I would probably have been over the moon. That was the one and only downside to this candle… the aroma was light. So, should you give this fragrance a try, start in a small room and go from there. Who knows, you may get a different result than I did. You never know. Love Wood Wick candles! Even if you don’t give Berry Sorbet a try, go look at their other fragrances. These candles are pretty cool!